August 31 is National Trail Mix Day. A worthy day to celebrate. 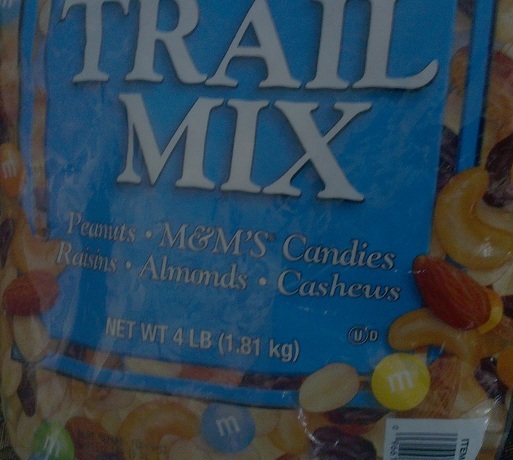 Trail mix has been a food staple in my life since I was very young. As a kid my mom would make up big batches of trail mix and have it ready for any party any time. I also remember sitting there watching her make up big vats of chex mix. It was magical. Watching her transform regular breakfast cereal into a new concoction that always was a crowd pleaser. Somehow no one has ever been able to replicate the same mix that my mom made when I was a kid. Either that or I have a more refined palette now but that's another story. Today we take it for granted that these were once homemade items and we buy them in bulk at the megastores. My appreciation for trail mix started when I would go hiking in the National Parks that are scattered throughout the Pacific Northwest. Back then it was called "Gorp". 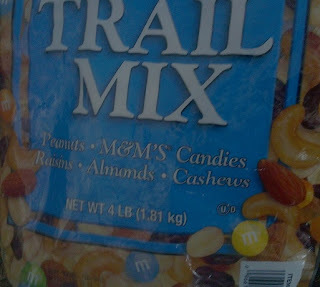 I'm not sure why but the name made it seem more fun than just calling it that mix of nuts, raisins, and m&ms. Hitting the trail for several days with a 40 pound pack that contained everything I needed and more to survive for several days was, at the time, tons of fun. When it came time for me to scale the mountain I had looked at from my dock all those years I got into my trail mix mode. 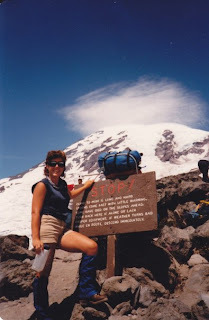 The first thing I did was to load up my pack with 50 pounds of books and hike up and down my driveway (which was .1 miles long) 20 times a day with the boots that I would be wearing on the actual ascent. That way my boots would be broken in and when I hit the trail with a 20 pound pack it would seem easy. The climbing guides I was set to go with sent me a list of things I would need and I set off to REI with my mom to pick up the last few items that I needed. I did not own a headlamp and I asked the guy at the store if that was really going to be necessary. He looked at me with this "you're an idiot" kind of look on his face and reminded me that it must be on the list for a reason. With headlamp in the bag we set off for the grocery store to pick up Trail Mix and other food items that I would need for the climb. I stocked up with the standard camping food of bagels, sausage, trailmix etc. I was ready. The climb itself was a two day endeavor. The first day we all met at base camp where we were met by our guides who reminded us that it was not their job to get us to the top of the mountain but instead it was their job to get us safely back to the base camp. If weather swept in or someone was not up to the climb we would turn around. We set off on the climb and made it up to base camp midway up the mountain in pretty good order. We all prepared our own dinners and settled in for the night. The next day we got up at 3:30am, donned our headlamps and set off for the final push to the top. It was really funky - it looked like a scene from the movie Shangri-La where they were all hiking in a line up to the lost city. The sun started coming out and we could finally see the entire mountain ahead of us. There was really no point of reference because it was pretty massive and I had no idea how much further we had to go to get to the top. We all stopped so that we could sit for a while and eat some of the food we had brought with us. I whipped out my trail mix, bagel and other camping food and started preparing a proper camping meal. The guide I was sitting next to started to laugh a little bit. "That's great if you're camping. But up here you just need fast calories". He pulled out a box of Captain Crunch and started eating right out of the box. That was when I learned one of the greatest lessons of my life. Trail Mix is awesome but it depends on what trail you're on. You need to adapt to your current situation and you need the right tools and right fuel for the corresponding job. This particular outing required fast calories that could push me on to the top. The food I brought was good food but not really for the moment. I thought this was great and I try to apply this lesson even today. When I travel I consider the location and purpose of the trip and pack accordingly. I try to consider various situations that I may have to deal with and respond quickly to so that I can be prepared for just about anything and still have everything I need packed in one carry on and a "purse". Since then I have read the book Deep Survival which has a similar lesson in it. It is a great book not only about surviving in outdoor adventure circumstances but in everyday life. So, pick up a package of Trail Mix and a copy of Deep Survival and have a great National Trail Mix Day. And if you'd like, find out what my fellow Women Wine Writers recommended as the perfect pairing for Wine and Trail Mix! CLICK HERE.